I’ve been checking out your “30 Minutes” series and was originally inspired to write my own ebook after reading your post on HN a few months ago. I have since wrote a small 48 page guide on “jQuery Plugin Development”. I haven’t launched it yet, just waiting for some feedback after sending it to a few friends first. The author was Robert Duchnik, a Canadian developer who was living in Thailand. We began corresponding, and tossed around the idea of releasing a programming title as an In 30 Minutes guide. This was an interesting area to expand into. Most In 30 Minutes titles are written for mainstream audiences. They range from Melanie Pinola’s book about LinkedIn to the experimental easy Chinese recipes cookbook on the iPad authored by Shiao-jang Kung. The jQuery Plugin guide was focused on a much narrower, highly technical niche audience. Marketing to this group would be a challenge. He’s a jQuery Plugin expert, with many years of experience in the field and the operator of Websanova, an online resource devoted to jQuery Plugins. Rob has an existing audience, via Websanova. From previous releases by Melanie and Tim Fisher (author of Windows 8 Basics In 30 Minutes), I have found that those authors who already have existing online audiences have a huge advantage right out of the gate. Not only can they turn to their fans to purchase copies and help spread the word, but by virtue of the fact that they have already interacted with the audience over time they have an innate knowledge of the problems that readers face, and what people want to know. This makes for better books and a better author/reader relationship going forward. There was already a draft manuscript. It needed some light editing and a proofreader, but otherwise it was in pretty good shape. The manuscript was short. This is an asset, as we want readers to be able to understand the topic at hand in less than 30 minutes. The market for books about jQuery plugin development had a hole. Through discussions with Rob and a quick analysis of competing titles, I determined that there is a need for this type of resource (high-quality, quick-start programming guide) on this topic, especially if it were priced right. This last point is important. I am not talking about low-balling the competition. 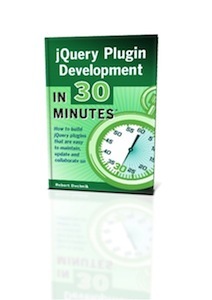 There are already lots of free online resources about how to write jQuery plugins. There are also a small number of books about jQuery plugins, but most of them are long and somewhat expensive. There was not much in the middle, in terms of length or price. This is where jQuery Plugin Development In 30 Minutes would live. Rob and I came to an agreement in January, and we moved forward with preparing the manuscript for publication. There were some new writing tools to try out, and some difficulties related to producing code blocks in Scrivener (my primary book production tool) but we established a workflow based on markdown and Github and published the title at the beginning of April. You can read the table of contents for the jQuery plugin book here. The title is available for the Kindle, iPad, Nook, and Google Play, as well as a paperback and a PDF.